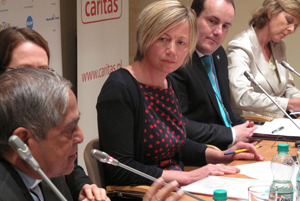 SCIAF (Caritas Scotland) Policy Officer Jo O’Neill reflects on a unique conference on faith communities attempts to tackle climate change and Poland’s first ever Climate Mass. The world of climate talks is a new one to me. It is a process perhaps best known for its complexity and breath-taking use of acronyms (there are talks on the ADP, NAMAS, SBSTA, BINGOs and BAP and the list goes on). But outside of the conference centre, our Catholic network CIDSE was holding a conference exploring the reality of climate change for people living in poverty and how faith communities are challenging it. Delegates from Africa, Asia and Latin America explained the devastating impacts of changes on communities in their countries. In Niger, rising temperatures are causing real problems for small-scale famers, already living in poverty. “We have the right to be heard at these talks” said Sabine Attama from Caritas Niger, “climate change is destroying the dignity of people”. As Yeb Sano, the Filipino representative at the talks, continued his fast, super-typhoon Haiyan in the Philippines has reminded us of the horrific human cost of extreme weather and on Tuesday the World Bank reported on the enormous economic costs. In Poland’s first ever Climate Mass on Sunday evening, Cardinal Nycz reflected on the damage being caused to the planet and prayed for creation. But there was a clear message from the Mass; we are not just stewards of creation, we are part of creation. “We have built a plastic world around ourselves” said Reverend Lukas at the CIDSE conference. “We live as if we are the last generation to inhabit the earth”. The spiritual connection to creation he argued, was being lost in many richer nations. Rebuilding this connection is urgently needed if we are to stop damage to the planet. The responsibility of richer nations to lead on climate action is at the heart of the climate talks themselves. If we are to address the devastating changes being experienced by people living in poverty rich countries must commit to reducing their damage to the planet. Faith communities were a key part of the movement that pushed for strong Scottish Government action on climate change. The result was not just a world-leading Climate Change Act but a Climate Justice Fund, which is helping communities adapt to the challenges of climate change. In Warsaw, faith communities are working together to remind politicians of the human cost of the climate change. It is crucial that they listen.